We at NerdWallet, located in San Francisco, dedicate this post to the adorable and admirable Batkid. Battling leukemia, this 5-year-old boy has brought together 12,000 people in Batman attire at Gotham City to dedicate their time to giving Batkid every boy’s dream: to become a superhero. Read more about this touching story here. NANANANA Batman! One of the greatest superheroes in all of the comic book history has landed a spot in our Best of Indie Spotlight blog, and we’re presenting you with a complete list of the top 10 Batman gifts from unique Etsy shops. Why is Batman super(hero)bly awesome? As a human without supernatural powers, unlike many other superheroes, Batman can do the impossible and unimaginable through his high-tech systems and deadly fighting techniques. A popular billionaire and businessman by day, a dark crime fighter by night, Batman’s vengeful spirit and unlimited resources protects the people and has become an admirable superhero that many love today. Created first in comic book form and reborn into top-ranked movies, Batman has become a celebrated public figure in many media developments. Not only can Batman lovers enjoy books, movies, and shows about Batman, but they can also delight in the Batman-inspired creations from artists and crafters. If you have a Batman fanatic in your family or circle of friends, put on your superhero capes and check out these extravagant originals from Etsy artisans to find the perfect holiday or birthday gift to tickle their Batman button! Transform any traditional, ordinary laptop keyboard into a superhero with Edward Stickerhands’ fun Batman Macbook keyboard stickers! Combining the tech and comic book nerd kingdoms together, the Batman keyboard stickers form Batman’s famous signal and logo — perfect for all Batman fans. Made with strong adhesive, the Batman Macbook keyboard stickers stay put during everyday use and presents an appealing, shiny look. With the Batman keyboard stickers, you can have Batman right at your fingertips! Glam queens from all over can proudly present their love for Batman and wear their favorite heels at the same time! 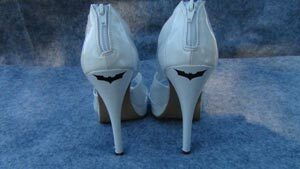 The Fog Shoppe presents a creative, edgy way to dress up heels for any occasion with their Batman vinyl decals. From funky purple to classic black, these Batman stickers come in a wide assortment of colors that you can customize to suit any of your heels. Made with quality and waterproof vinyl, The Fog Shoppe’s Batman vinyl stickers can handle harsh conditions — just like a true superhero! High heels aren’t the only places these fabulous decals can be applied on — from wallets to cell phones, you can stick them anywhere you desire. 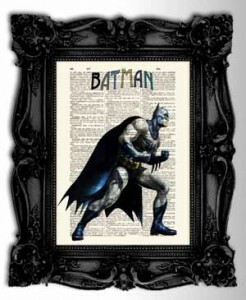 Embellish a home office or bedroom with Fashion Art Studio’s Batman book print! Created on an antique French dictionary page from the 1800s, this vintage Batman artwork is detailed, making it leap off the dictionary page. This print fits an A4 frame and has the dimension of 8.5’’ x 11’’. Fashion Art Studio offers two variations of this print to add “Batman” on the art print or not. 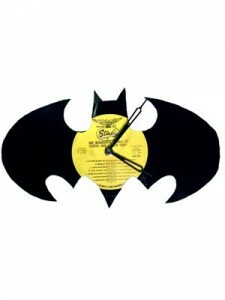 Let Batman keep you on time with Tick and Tocks’ Batman Vinyl Record Clock! Tick and Tocks hand cuts this trendy home decor item from vinyl records. Tick and Tocks offers custom requests for colors and records for its clocks. Accessorize with the Dark Knight with Ardent Argent’s inscription ring! 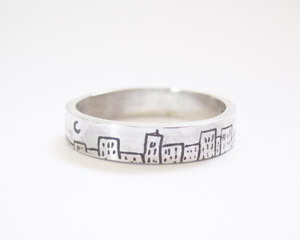 On the outside of this band, Ardent Argent presents an etched cityscape. On the inside, “The Dark Knight” is inscribed on the band. Excellent for collecting Batman inspired goods, this ring is a fashionable and unique adornment. 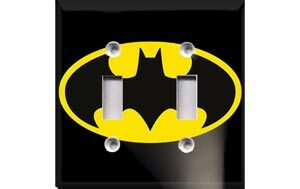 Give any room a Batman flair with Crazy 8’Z Decor’s Batman light switch plate! Crazy 8’Z Decor’s Batman light switch plate is ready to install, packed with compatible screws. This Batman light switch plate is made with sturdy nylon cover, which makes for a long-lasting home decor item. Crazy 8’Z Decor offers double light and triple light switch plates for this specific design in its shop! Give kids a gift they’ll love to hang in their room! 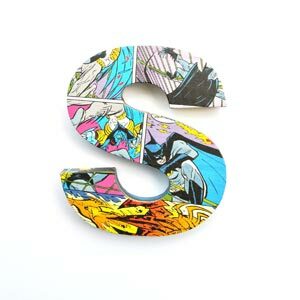 This customized Batman comic book letter is created at Roseberry Boutique. Made with lightweight Styrofoam and covered with Batman comic book fabric, this fun and colorful decoration is ready to put on walls right away with its convenient double-sided tape on the back. Give the golfer in your life a superhero way to protect his or her beloved golf clubs with Tracey Knits’ Batman knit golf club cover! This Batman golf club cover is knitted to resemble Batman’s signature look. 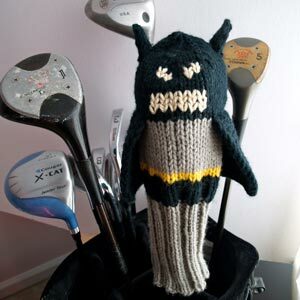 You can also find other superhero figures in Tracey Knits’ shop and pair this Batman golf club cover with others. Bake with stylish Batman oven mitts from Geeky Boyfriend! 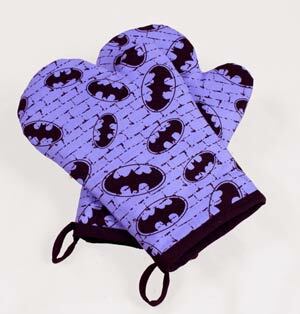 This unique set provides two oven mitts, which can be given to two Batman fanatics in your life instead of one. With these Batman oven mitts, baking will be one superhero adventure! You can also find other fun and decorative oven mitts in My Geeky Boyfriend’s shop. 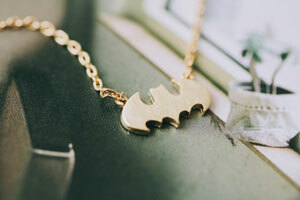 Show your love for Batman with this quaint Batman symbol bracelet from LETTERS EARRINGS. Even with this simple and subtle accessory, you can still have one of the world-renowned superheros on your side. LETTERS EARRINGS allows you to choose the color for your bracelet, which range from gold to pink. This Batman charm bracelet can be given as a friendship bracelet, which makes for a great present for your closest friends. Decorate your adopted child’s room with I Want To Be’s wall art! 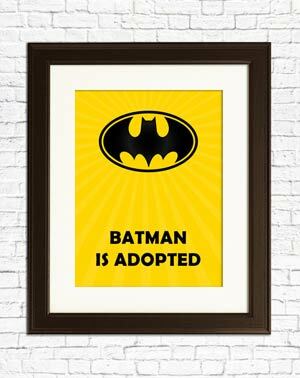 This minimalist style wall art displays the Batman symbol and the words “Batman Was Adopted” on a sunny, bright yellow background. Knowing that your child’s favorite superhero was adopted can help him or her feel understood, comforted and proud. I Want To Be also offers other superhero adoption wall art, which you can buy them all to decorate your adopted child’s room and make him or her feel like a superhero! Feel safe and secure as you sleep during the mysterious nighttime with Julia Wine’s unique Batman sleeping mask! 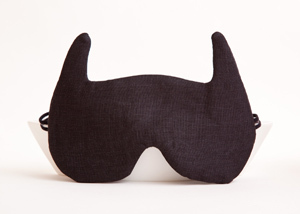 Crafted with soft, comfortable fabrics, this sleeping mask offers the ideal sleeping companion. With Julia Wine’s Batman sleeping mask, you can become your own Batman character, even in your own sleep, with this symbolic mask. This sleeping mask can also protect you from evil while you sneak in a cat nap during the day. With this short catalogue of the best Batman-inspired gifts around, you can create your own gift shopping list for all of the Batman fans in your life! From children to adults, Batman is a timeless character that is represented through an endless list of items for all age groups and personalities. 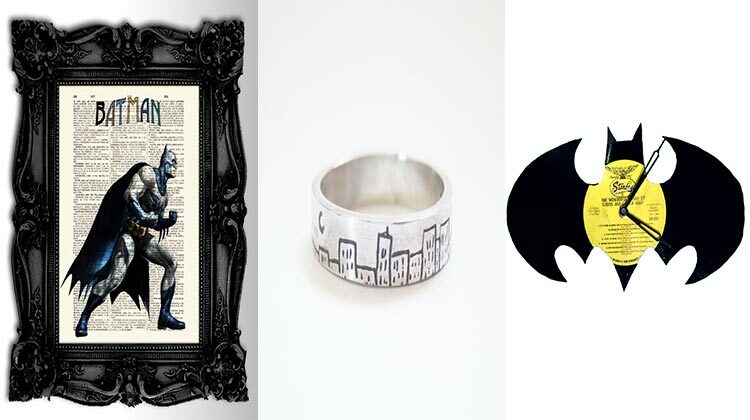 Make each present meaningful to your recipients with any of these fabulous, imaginative Batman products.